Bimmerfest - BMW Forums > The Best of Bimmerfest! > Do-It-Yourself H.Q. Share your DIY projects that have helped you keep your BMW running. For questions about how to fix your BMW use the model specific forums. All BMW DIY tips, tales, and projects discussed inside. Learn to work on your car and know the right BMW parts you will need! Like many others, I've had problems with the sunroof shade on my 330. It was not sliding properly and was binding up when I operated the sunroof. There are four "clips" that attach the shade to the slider mechanism that are notoriously poorly designed. It doesn't take much to break them. 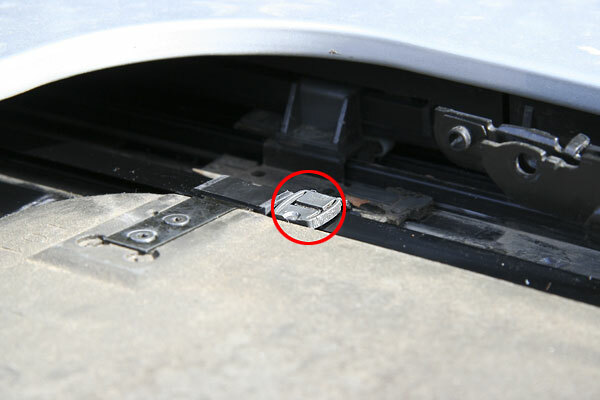 I put together a quick Sunroof Clip DIY (with pictures) describing how to replace these clips. When I did this repair I found that none of my clips had actually broken. In my case, one of the clips on the right side, had popped out of the slot in the sliding member and it was causing the shade to bind up when the sunroof was opened/closed. Now that I've had it apart, I'm certain that I'd be able to replace them if/when my clips break. Yes very nice. This turned out to be one of the easiest DIYs. My shade wont slide back beyond two inches. My question is.....how do I loosen the 6 torx screws when I can't get to them? Anyone??????? flip moon roof up and you should be able to slide shade back. Never argue with an idiot. He will drag you down to his level then beat you with experience. That is the problem, it wont go back more than 2 inches. It was like that when I bought it used. It goes back with the glass when it is opened, but comes back up with it when it is closed. I would like to fix it, but I don't want to brake anything in the process. Sounds like someone did a DIY and whacked the sunroof shade back on the wrong side of the sunroof driver... I did this yesterday and it won't allow you to move it back but it goes back with the roof but not all the way into the roof. first thank you ChrisF, second I LOVE THIS Forum!!! I been reading for like 4 days now, my work productivity has gone down ever since I registered here. I just fixed my shade, I need 1 clip when ever I get one but I swapped one and put this back in the track. Does any one recommend any online sites to order this from? The sun shade on my wife's 2003 325Xi just came loose. It doesn't seem to be sliding correctly in any tracks. I haven't done anything with the car yet but based upon this writeup I will probably see if I can fix it before resorting to the stealer. (I was really hoping I didn't have to remove the headliner). If the clip broke off inside, what are the chances that this piece will remain in the roof of the car & can jam the sunroof mechanism? Very nice DIY. But the glass does not have to be removed in order to remove the shade. All you have to do is just hold the shade closed as you fully open the roof. The shade will be then be exposed and you can lift it out. Found another thread about sunroof that mentioned S.I. B54 05 06. Talked to the dealer again armed with this information and now they are going to cover it under CPO. Go figure. How exactly did u achieve that? There is a tab that automatically pulls the sunshade back when you open the glass? Seems to me that holding it shut would break something? Just like I said in the post. what is the part number of the "driver"
I can't find the part number in the diagram. Were you able find this part number of the "driver"? i can't seem to find this driver in the realoem.com catalog. I've been looking for the slide stop (part behind what you circled).. I guess our best luck is to go to a junk yard. Its not listed on realoem. I hvae recently run into the issue where my sun roof will not open in slide mode fully. It appears as per the forum that something on the lid/cover has broken and prevents the roof from fully opening. I woud like to use johnewhites plan to open the roof while holding the cover lid closed, however I am not able to close the lid/cover as it gets stuck halfway. Does that leave me no other option that to remove the roof by lifting it out after removing the 6 torx screws? I ran into the same issue. You have to keep giggle the lid back and forth until it comes loose. just wiggle the lid/cover loads and hope it comes loose? I finally got round to taking my roof out yesterday afternoon. Once the roof was out it was easy to spot the issue. It appears somehow that the driver got ahead of the front clip. I removed the front clip by taking out the 2 screws to allow me to move the shade and front clip behind the driver. Put everything back together and voila! The plastic on the driver was a little pushed up, but I managed to clip it back into position. Thanks all for your good support and posts. Took me no more than 45 mins to remove the roof, fix the issue and re-assemble the bits on my own. Thanks guys for the posts, I have the same issue and will attempt to DIM since I'm now armed with valuable knowledge and have a starting point and a direction to follow. If anyone has the part numbers to this kit, that would help. I have a 2002 325i BMW. 2. you can remove the entire slider and still close close your sunroof normally, so like for me, i could still drive around with no worries while i waited for the parts to come in!